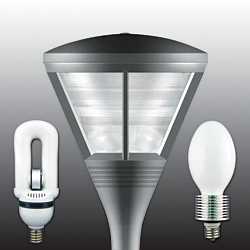 The company’s retrofit induction light bulbs range from 50 to 150 watts and are designed to screw into the same sockets as mercury, HPS or HID bulbs in all Acorn type fixtures. Bulbs come in 5,000K or 4,100K. CRI above 80 and 75 to 80 lumens per watt.